Creating a beautiful carousel music box by yourself is a great achievement and it is very interesting to give it to children. Featured 18-tone carousel music box movement, the sound quality is more crisp and loud. With manual clockwork power, no other energy is needed. You can develop a box to improve your child's ability to grasp, insert and buckle. Puzzles music boxes can develop children and improve children's understanding of the spatial structure. Each piece of the puzzle is different. Only when the right part is found can it be assembled to complete the observation and identification skills. ✔Put together by following the numbers. ✔Slowly assembling with patience is advisable. ✔One-time assembly and not for repeatedly disassembling. ▶Choking Hazard- Small Parts, Not for children under 3 years. ❤➟Versatility :This carousel music box can be inspire children's curiosity, curiosity box to explore the spirit, and better develop creativity; Training children's hands-on ability, lay the foundation for the development of books, paintings, labor skills and skills. 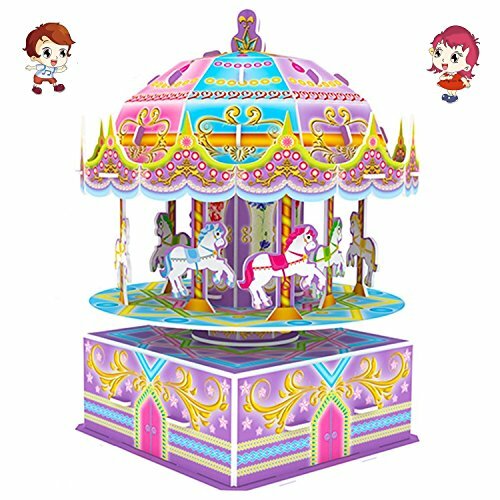 ❤➟Safe use: These carousel music box puzzles are specifically designed for children. Puzzles do not have sharp edges and will not harm children's hands without glue, batteries or scissors are not required. ❤➟Multi Benefit :Carousel music boxes, Parent-child interaction, visual training, hands-on brain, original design, easy to assemble, no scissors, no glue. ❤➟Good gift: The perfect gift for any occasion. This carousel music box suitable for birthday gifts for boys and girls at any time, such as learning and educational toys. Suitable for Christmas gifts, birthday gifts, Halloween gifts or anytime for your children.